When we think about seeds, the images we most often conjure are simple, comforting and tangible – planting vegetable and flower gardens in the spring, spitting watermelon seeds on a hot summer day, toasting pumpkin seeds after carving jack-o-lanterns in the fall, feeding bright cardinals in the winter. Seeds are for all seasons. What most of us don’t think about are unsettling things like toxic pesticides, pollinator decline and the illegalization of seed-saving. Unfortunately, these are all prominent features of agriculture in America today. And this has a lot to do with the enormous global corporations that have gained control of the world’s seeds, the source of our food supply and the indispensable basis of all agriculture. Farmers have been breeding, saving, re-planting, and freely exchanging seeds for millennia. In the 20th century, public sector breeders developed countless new crop varieties for farmers in the U.S. and around the world. The result of all this biological innovation was a rich diversity of seed varieties in every crop: plants adapted to various cuisines, geographical regions, soil types and weather conditions, as well as pest and disease threats. Over the last few decades, however, a handful of agrichemical giants have acquired much of the world’s seed supply. Just five companies – Monsanto, DuPont, Syngenta, Dow and Bayer – account for 62% of world seed sales. This buying spree was driven by two key developments: the new technology of genetic engineering and the issuance of the first patents on seeds in the 1980s. As discussed below, genetic engineering is used primarily to develop seeds that dramatically increase use of pesticides the companies also sell; while patents ensure higher profits from seeds, in part by allowing the agrichemical giants to outlaw farmer seed-saving. This new order has already resulted in higher seed prices and declining choice of seed varieties, thousands of farmers sued for seed-saving, and sharply increased dependence on toxic pesticides – both weed-killing herbicides and insecticides. Now, two of the world’s largest pesticide-seed companies may merge into a still bigger entity. German pharmaceutical and chemical giant Bayer AG recently offered $62 billion to acquire Monsanto Company, the biotech, chemical and seed behemoth. While Monsanto rejected this offer, it remains open to a better one. Two other mega-deals are also in the works. 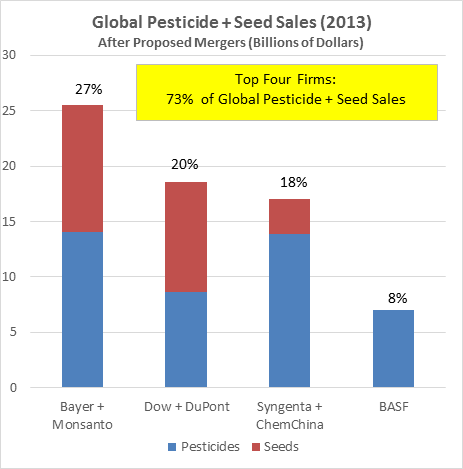 If all go through, the result would be an unprecedented oligopoly of just four mega-corporations that control an astounding 73% of the world’s combined market in seeds and pesticides: Bayer-Monsanto, Dow-DuPont, Syngenta-ChemChina and BASF (see graph). What would this mean for the future of farming? It doesn’t look good. 1. Seeds + Herbicides: Resistance is Profitable… Monsanto and Bayer both use genetic engineering to generate crops that survive direct application of the herbicides they also sell. Weed-killers that once had to be applied sparingly (to avoid injuring the crop) can now be sprayed throughout the growing season. Monsanto’s genetically engineered (GE) glyphosate-resistant corn, soybeans, and cotton rule today. But the huge increase in glyphosate (aka Roundup) use triggered by these crops has generated an epidemic of glyphosate-resistant weeds that mighty Roundup no longer kills. The agrichemical industry’s response? Engineer crops immune to additional herbicides, so they too can be sprayed with abandon. The union of Monsanto’s seeds and Bayer’s herbicides would perfectly position the merged giant to fully exploit this toxic but highly profitable “transgenic treadmill” of increasing herbicide use and weed resistance. Why should we care? Well, herbicides are bad news for people and nature. For instance, the World Health Organization’s cancer experts recently determined that glyphosate is “probably carcinogenic to humans,” pointing to studies of cancer in lab rodents as well as glyphosate-spraying farmers. On the environmental side, glyphosate has virtually wiped out milkweed in Midwest corn and soybean fields, a major factor in the dramatic 20-year decline of monarch butterflies that depend on milkweed for food and reproduction. And these are just harbingers of worse to come, as new GE crops intensify the use of many other toxic weed-killers, like 2,4-D and dicamba. 2. Seeds + Insecticides: Till Death Do Them Part…. Bayer is the world’s leading producer of a class of highly toxic insecticides known as neonicotinoids. You’ve probably heard about them, “neonics” for short. They’re coated on the seeds of most major field crops – corn, soybeans, cotton and canola – and diffuse throughout the tissues of the growing seedling. This marriage of seeds and insecticides is big trouble, because neonics are incredibly toxic to bees and implicated as one factor in the decline of pollinators around the world. And they kill other beneficial insects as well. Slugs that have been made toxic by consuming neonic-treated seedlings actually poison ground beetles that try to eat them. To make matters worse, objective research shows that neonics provide little or no benefit in terms of crop yield, so it’s not clear what they’re doing on the seed at all. Just as momentum is building to restrict these toxic insecticides to protect pollinators, or at least give farmers the choice of untreated seed, a merged Monsanto-Bayer would have every incentive to expand their use to all of Monsanto’s seeds. The Department of Justice has ample reason to block this merger of giants on traditional anti-trust grounds. The combination of Bayer and Monsanto would diminish competition in the increasingly intertwined markets for seeds and pesticides, reduce socially beneficial innovation, increase seed prices, and reduce seed choices for farmers (particularly non-GE and untreated seed options). All of these impacts would be exacerbated if the two other proposed mergers – Dow-DuPont and Syngenta-ChemChina – also go through. Thus, it’s no surprise that anti-trust and farmer organizations are also opposing the proposed combinations. Here, we’ve shown that the merger’s adverse effects would extend well beyond the traditional anti-trust arenas of competition, prices and choice. The merger would also go a long way towards reinforcing the poisonous linkages between pesticides and seeds that are already having such harmful consequences for people and the natural world. If Bayer + Monsanto is an unwise marriage of pesticides and seeds, then now is certainly not the time to hold your peace. Keep posted and we’ll help you speak out as opportunities arise. Concentration in the seed and pesticide markets if three potential mergers go through. Assumes no divestitures. Based on: Breaking Bad: Big Ag Mega-Mergers in Play, ETC Group Communique 115, December 2015. http://www.etcgroup.org/content/breaking-bad-big-ag-mega-mergers-play.